Crans-Montana is situated at 1500 meters in elevation. 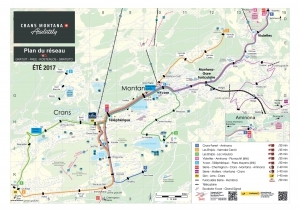 Thanks to the A9 highway and the road network, Crans-Montana is easily reachable by car or trucks. Several international airports are located within reasonable distance from Crans-Montana, the international airport in Sion is the closest. Crans-Montana is easily reachable thanks to the European railroad, which will bring you to Sion or Sierre. You will find direct connections from Basel, Berne, Geneva, Lausanne, Zürich and Milano. Web: www.cff.ch. A funicular also connects Sierre with Crans-Montana (12 minutes). You can also take a taxi (+/- CHF 70.—from Sierre, +/- CHF 90.—from Sion).